Is Making Your Own Stock Worth the Effort? Today’s guest post comes from the book The Science of Cooking , by Dr. Stuart Farrimond (who we recently interviewed for the Fit Bottomed Girls Podcast, and boy is he a fascinating guy! ), and it answers a question we hear a lot. We know using stock in dishes is important, but is it really worth the time it takes to make your own? Here’s what Dr. Stu — and science — has to say. Ask a classically trained chef what raises a good dish into a phenomenal one and they will tell you it is the stock. The benefits of making your own stock are undeniable: homemade stock lends dishes a depth of flavor that no powder or cube comes close to. The French chef Auguste Escoffier, who pioneered classical French cooking, insisted that without a good stock prepared from fresh ingredients, food would never be better than distinctly average. 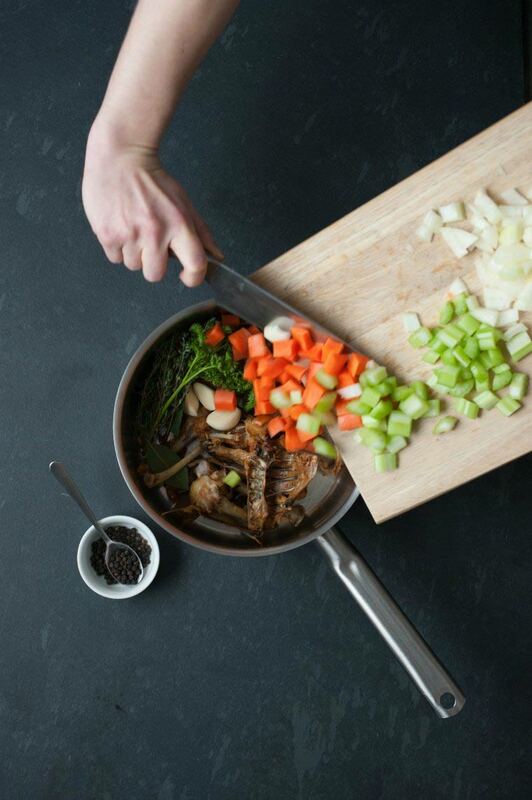 A stock is an extraction of flavors from fresh ingredients. In near-boiling water, flavor molecules diffuse out of vegetables and meat as they slowly cook. There are no absolute rules, although it’s best not to salt stock, and keep flavorings simple and subtle so that the stock can be used for a variety of dishes — you can add strong herbs and spices later. A basic meat or vegetable stock forms the foundation of many dishes: it can be thickened with flour into a “roux;” mixed with wine, herbs, and spices; reduced into a concentrated, intense jus; enriched with cream or butter; or bulked into a soup. Simply the French word for “broth,” bouillon has become widely used as a name for premade stock powder. Chopping ingredients into small pieces speeds flavor release as it increases their surface area, liberating flavor molecules and the gelatin from meat and bones. You can use a pressure cooker in place of a saucepan — it allows water to reach high temperatures without boiling, speeding flavor extraction and keeping liquid clear. 1. Brown the chicken. Break up one whole chicken carcass into pieces and roast in a preheated oven for 20 minutes at 400°F (200°C). Alternatively, cook the pieces in a little oil in a frying pan over a medium heat until golden-brown. Browning the chicken creates the Maillard reaction, which will add intensity of flavor to the stock. 2. Add vegetables and aromatics. 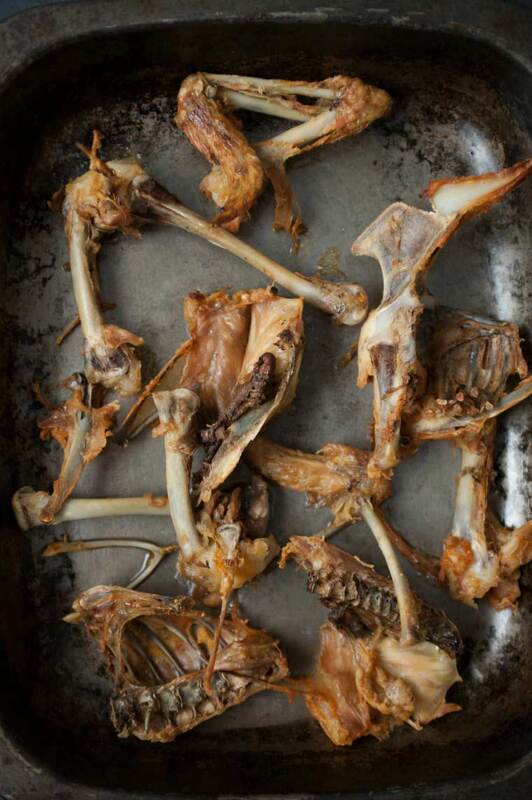 Place the chicken bones in a large pan. Add one diced onion, 2 diced carrots, 2 sticks celery (chopped), 3 cloves of garlic, ½ tsp whole black peppercorns, and a large handful of aromatic herbs, such as parsley, fresh thyme, or bay leaves. Cover with cold water to about 1 in (2.5 cm) above the level of stock ingredients. 3. Heat on the stove. Bring to a boil, then reduce the heat. Simmer gently for at least 1 ½ hours (ideally 3-4 hours). Skim off scum that rises to the surface. If using a pressure cooker, cook for 30 minutes to 1 hour. 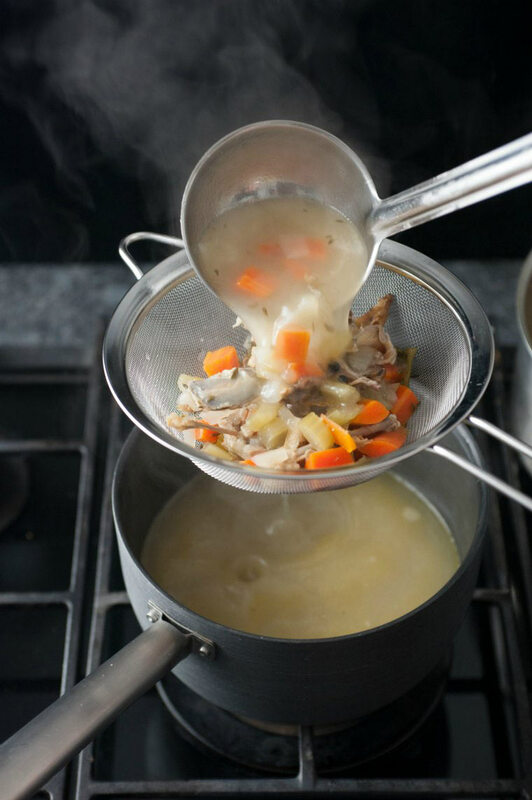 Remove the stock from the heat and allow it to cool, then skim off the fat and pour through a fine sieve. Use immediately, store in the fridge for up to 3 days, or freeze for up to 3 months. Excerpted from The Science of Cooking, reprinted by permission of DK, a division of Penguin Random House LLC. Copyright © 2017 by Dr. Stuart Farrimond.